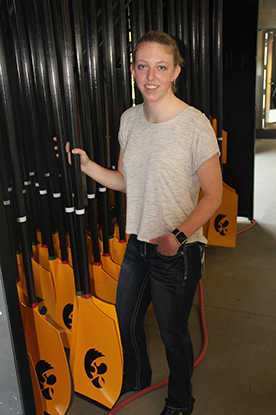 Kaitlyn Daugherty is the academic version of what sportscasters call a triple threat: chemistry/biochemistry student, crew team member and Hawkeye Health C.A.R.E. intern at the State Hygienic Laboratory. Health C.A.R.E. (Career and Research Exposure) is a partnership between Iowa Athletics and the University of Iowa Hospitals and Clinics that matches student athletes with an interest in health careers with university departments that specialize in the field. C.A.R.E. has three components: Exploring, Narrowing and Focusing. Students start by exploring three or four health areas by job shadowing the first year. In the next years, they are asked to narrow their interests and, finally, to focus on one area where they might intern. The program began in 2015 with 20 participants who took part in at least 10 hours of job shadowing. That year, Daugherty shadowed in an immunology lab and with a clinical pharmacist. But, this summer, Daugherty is using her twelve-week stint with the Hygienic Laboratory to work with staff in the Radiochemistry and Sample Prep sections, assisting with sample testing, preparation and processing. After putting in 32 hours at the lab from Monday through Thursday, she attends a C.A.R.E. program on Friday that includes a lecture by a health career individual and discussion among the student athletes about their impressions. Daugherty, a native of Fairfield, just finished her junior year at Iowa. In high school, she took part in cross country, track, soccer and basketball. But, when she enrolled at Iowa, she found her true sport. While attending freshman orientation, Daugherty was approached by a women’s rowing coach who took a look at her height (6-feet) and her obvious athleticism and asked if she’d like to try rowing. “I fell in love with the sport and have been doing it ever since,” she says. The UI honor student is one of 40 student athletes this summer who are shadowing or interning through the Health C.A.R.E. program. They are working with nurse practitioners, cardiac surgeons, dentists and other health professionals, including environmental and public health laboratorians at the Hygienic Lab. Daugherty expected to gain new skills with instruments and techniques during her internship. What was a surprise was the amount of work the lab does for other states. 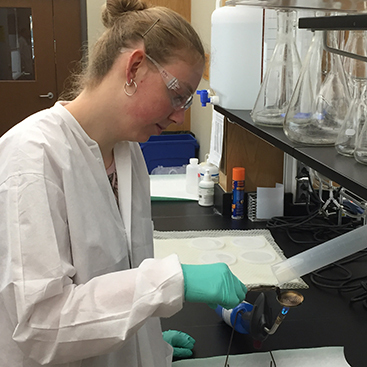 Kaitlyn may still apply for medical school in the fall, but her time in the State Hygienic Laboratory’s environmental health division has shown her other options.